The MuscleXP Plant Protein Powder is soy, Lactose and nut-free that helps eliminate risks of common allergies. A glass of delicious chocolate shake with this MuscleXP protein powder helps to boost stamina and vitality. It is known to enhance muscle growth. Protein is the building block for muscle. MuscleXP Protein powder could meet your need to maintain lean muscle growth and recovery. Containing Pea Protein, Brown Rice, Flax Seed Powder, Amla Powder, Tomato Powder, Carrot Powder, Beetroot Powder, Blueberry Powder, Barley Seed Powder, Spinach Powder, Ashwagandha Powder, Green Tea Extract, Grape Seed Extract and Papain, this protein powder is known for its immense health benefit. All the ingredients go through a strict quality check to ensure they are of the highest standard. 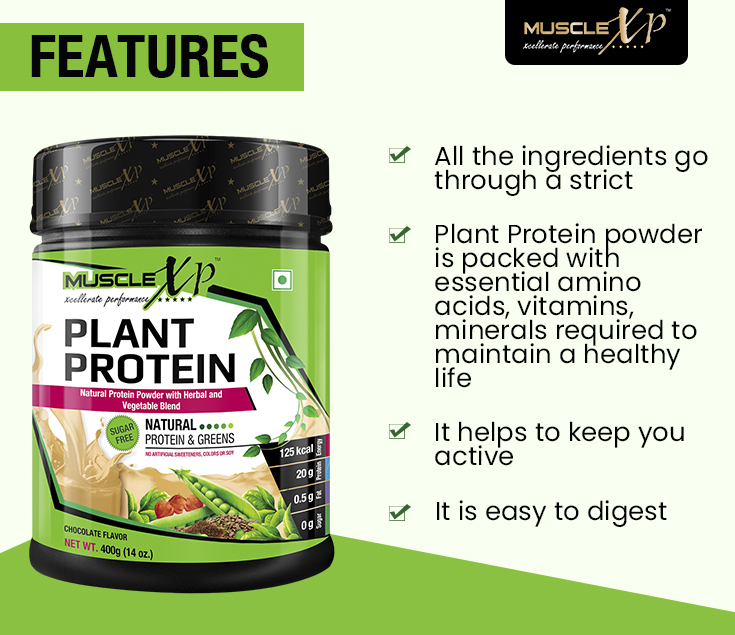 Enriched with plant-based powder and extracts, MuscleXP Protein powder is packed with essential amino acids, vitamins, minerals required to maintain a healthy life. It helps to keep you active. Flaxseed Oil Powder, being a great source of protein, helps build muscle. It also helps you to recover faster. Being the purest form of Vitamin C, Amla or Indian gooseberry powder helps to boost your immunity and is considered beneficial for your hair, skin and overall health. Additionally, enriched with antioxidants, amla fights free radicals in the body and reduces cell damage. Beetroot ensures that enough oxygen is present in the muscles during a high-intensity workout and hence enhance your blood circulation and aids in athletic performance and cognition. It contains antioxidant constituents. 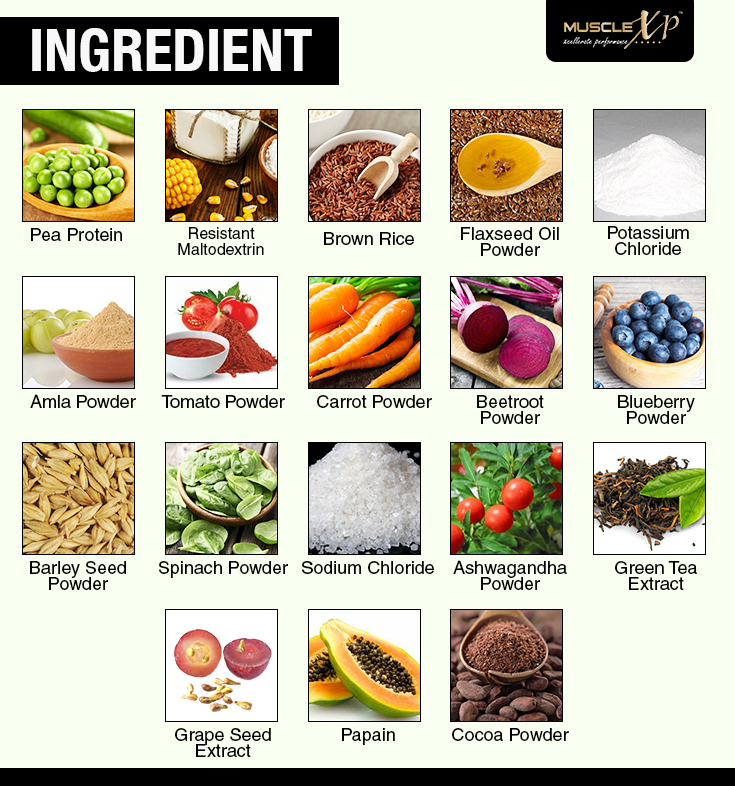 Pea Protein, Resistant Maltodextrin, Brown Rice, Flaxseed Oil Powder, Potassium Chloride, Amla Powder, Tomato Powder, Carrot Powder, Beetroot Powder, Blueberry Powder, Barley Seed Powder, Spinach Powder, Sodium Chloride, Ashwagandha Powder, Green Tea 60% Extract, Grape Seed Extract, Papain, Cocoa Powder. This is the perfect protein supplement for vegans. I am taking this protein powder daily. The chocolate flavor has made it delicious. I’m taking this protein powder for a couple of weeks. It has a nice chocolate taste. It blends well and makes delicious protein shake. It satiates my hunger and keeps me full. Good quality protein powder. Tastes good. It is providing me additional protein I need to maintaining muscle mass. Good protein powder. I feel full after taking it. A good addition to my vegetarian diet. Getting loads of protein from this supplement. A healthy source of protein obtained from veggies. The ideal protein supplement for vegans. I’m taking this and satisfied with the result. Add 2 scoops of MuscleXP Plant Protein Powder in approx. 250 ml of cold milk or water and consume.